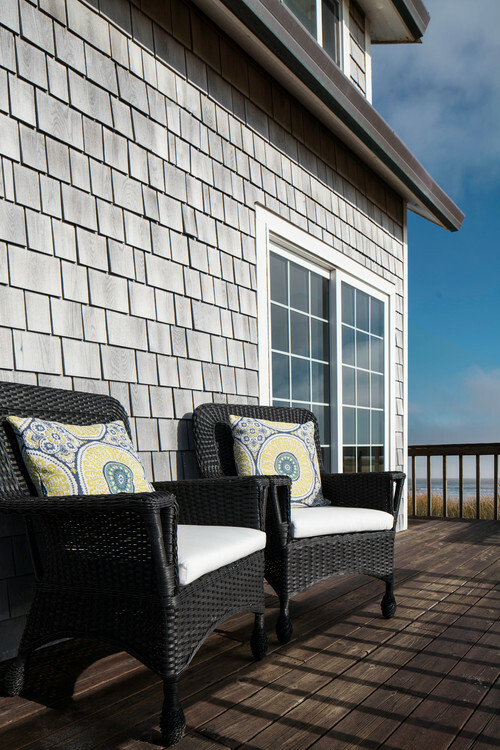 This week's Living Large In Small Spaces feature is a charming cottage on the Oregon Coast. 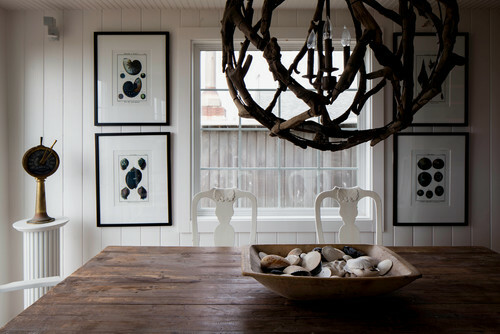 This beach house on Oregon's Rockaway Beach is the weekend getaway of Seattle interior designer Barbara Hyde Evans. Move-in ready when she purchased the home, a few personal touches made it her own. 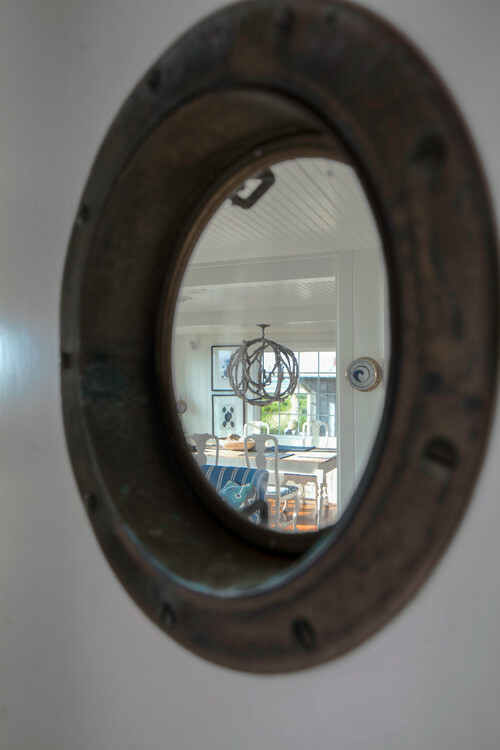 The original front door with a porthole window sets the interior's nautical tone. The woven chair cushions are covered in indoor-outdoor fabric which makes using them on the deck an option. The antique trunk came with the house. The dining table was specifically purchased for the cottage. 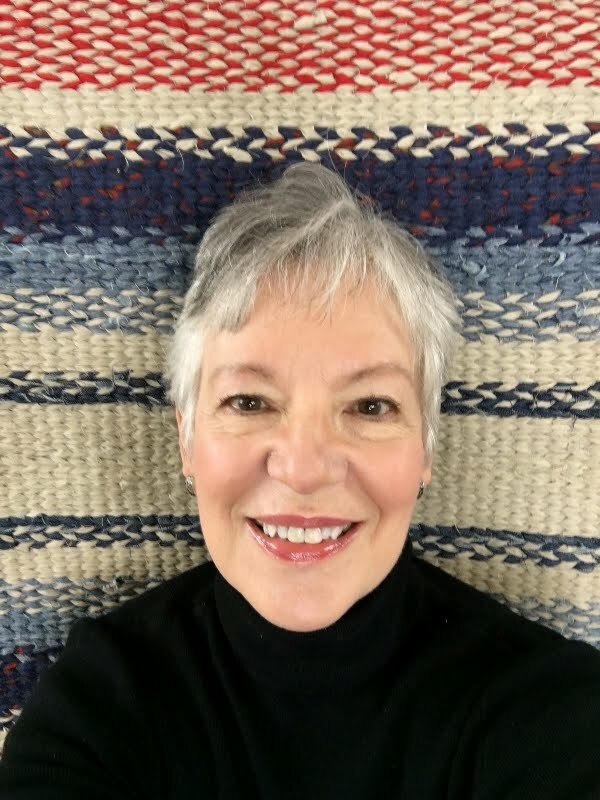 Hyde Evans brought the antique chairs from her Seattle home, painted them white and reupholstered the seat cushions. 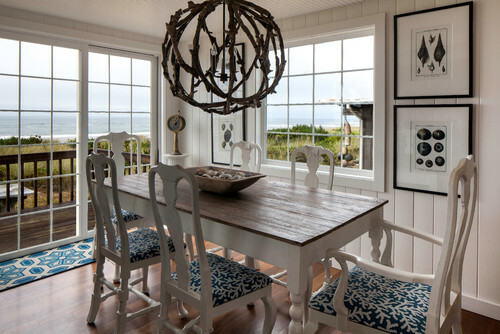 Note that the chairs have a shell design, which makes them and the driftwood chandelier perfect for a beach cottage. The centerpiece bowl holds shells collected on visits to various beaches. It's not surprising that the delightful kitchen with its butcher block countertops, beadboard cabinets and glass cabinet doors is what sold Hyde Evans on the cottage. The TV room on the second floor houses a large, deep sofa that belonged to the home's previous owner. Rather than remove it, Hyde Evans slipcovered it in a linen-like indoor-outdoor fabric and left it. Guests find it comfortable to sleep on, so the room can serve as an extra bedroom, if needed. The master bedroom is soft and serene. 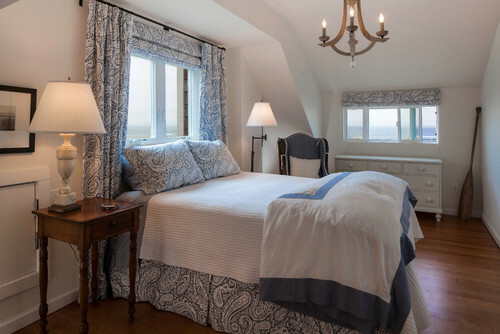 Hyde Evans designed the custom bedding and window treatments. She brought the marble lamp and side table from her full-time home, and the vintage dresser came from a local shop. The vintage oar in the corner is a nice touch. 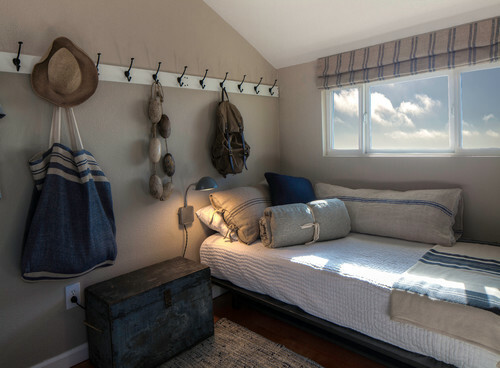 The second bedroom is more rustic with flour sacks and an antique blue trunk. A row of coat hooks created by the designer make a charming statement. I could easily live in this fetching cottage. 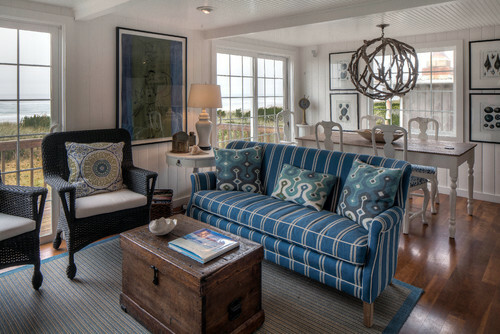 Read more about the cottage on Houzz here. Love this, and especially the view! Just love these posts! What a beautiful view and lovely decor. Oh, my friend! You've topped them all!!! 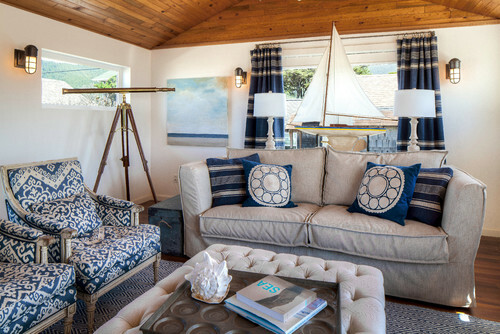 I'm ready to move into this beach cottage and spend the rest of life there. Rockaway Beach is about ninety minutes from my home and it's a wonderfully quaint little town on the Oregon Coast. This one speaks to my heart. Wow that view is gorgeous. This is another beautiful place. Thanks for sharing so we can swoon over this place. Happy Weekend Nancy. Such a loving home, so comfortable and nice, thank you for sharing it with us today, dearest Nancy ! So cozy and sweetly snug. Then to be on the coast? It really can't get any better. Every room perfectly done! 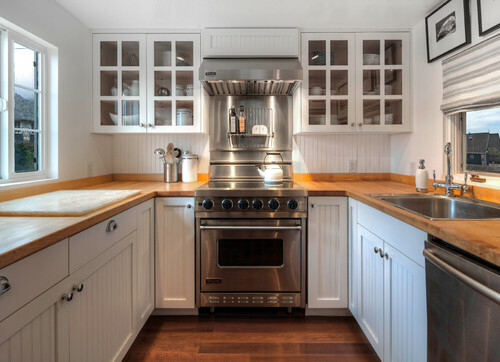 I adore that kitchen. Wood counters, bead board, perfect. I like her nautical style. Stay warm my friend. Very cozy. Love the blue throughout. I too could call this home . . . Seems a larger cottage than others . . . The blues, whites, naturals flow perfectly . . . The four framed pieces aside the dining room window . . . I found interesting . . . Isn't that trunk a keeper! The ceiling, the bedroom hook wall piece . . .
And the view . . . well then . . . I love everything in this post!! My favorite colors! It is a dream cottage for sure. This house is charming! I love every room. This cottage may be my all time favorite! It has my favorite decor, favorite color scheme, favorite views. And I'm an Oregon native, so it all speaks to my heart. The one thing I miss from my old home is the butcher block counters. 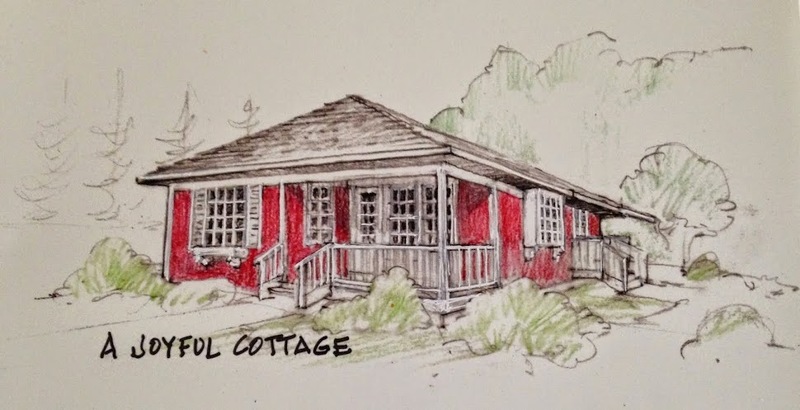 I hope the new owners kept them, but I never look back to find out ;) Darling cottage! What a beautiful, serene cottage, and that view! Thank you for sharing this, Nancy, I could love living there! And thank you for visiting my French Country Easter Tablesetting Post and entering the Give Away. My pleasure, Lidy. Thanks for stopping by!